fill the rest of your tin or mug with water. 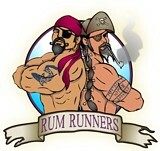 Water and rum mixed together was often called Grog. A dram (a small amount) of rum was often added to a sailor's water ration. A proper grog often included lime juice to help to stave off scurvy and a measure of cane sugar to help kill the bitterness of the water.